Wow! Am I the last person on earth to cook celery? JUST celery! What I've been missing these last (ahem) 29 years! Like everyone, I go through piles of celery. If there's onion and garlic in the pot, chances are there's celery too. And Day 247's celery & apple salad was memorable, perfect when you run across celery that still has its leaves. But other than that? Nada. NUTRITION NOTES ... You're gonna LOVE this. Carb Counters? Celery has only 2 grams of NetCarbs: now that's low-carb. And Weight Watchers? Zero Points. No Points. Nada Points. Got it? Eat the plate if you like. KITCHEN TIP ... How to keep celery fresh in the frig for a good month. NEXT TIME ... Why mess with perfection? 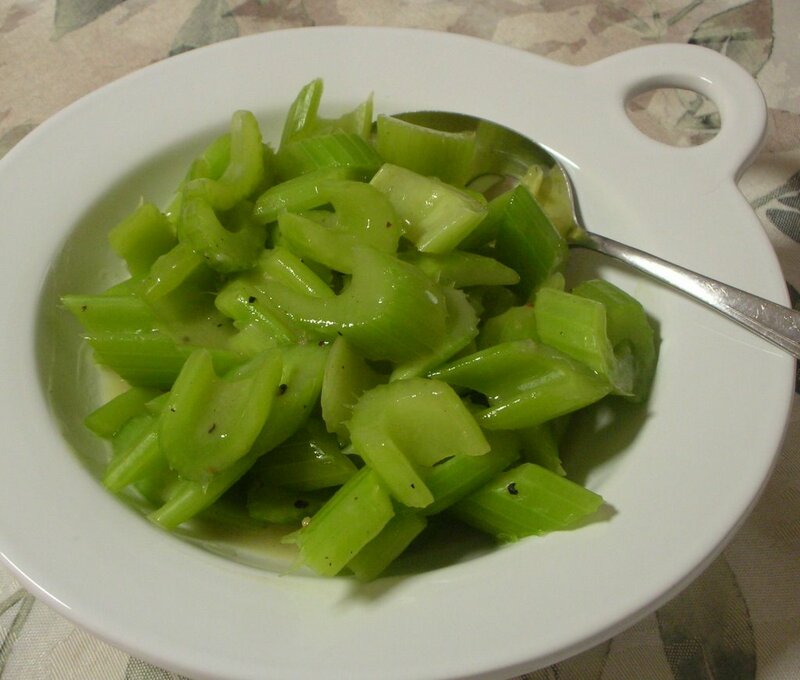 The celery has great tooth-crunch and pepper-bite. FROM THE ARCHIVES ... Check the Recipe Box for more low-carb vegetables and more zero-point vegetables. Heat the stock on MEDIUM HIGH in a skillet large enough to hold the celery in a single layer. Meanwhile, wash and trim the celery, then slice into one-inch pieces. Add the celery to the skillet and stir to wet. Sprinkle the flour and salt and pepper overtop and stir a bit til the flour is no longer visible. Reduce the heat to MEDIUM (or whatever will hold a slow simmer), cover and let cook til the celery reaches the 'crunch' you like (it will get soft if that's what you want but will take longer to cook), stirring occasionally. Serve and enjoy! 1. Favorite veggie would be beets. 2. Least favorite would be bad tomatoes...uh oh I think they are a fruit. So...maybe plain celery...boring. 3. I've never tried rutabagas. 4. The hardest thing about getting veggies on the table for me right now is having the right cooking pot. We are temporarily living in an apartment and I did a poor job of figuring out what pots and pans to unpack. Now some of my "essentials" are buried in a box in storage. This is good. The whole family liked it and I'm making it for the second time. Hi Anonymous - so glad you loved the celery, thanks for the reminder!